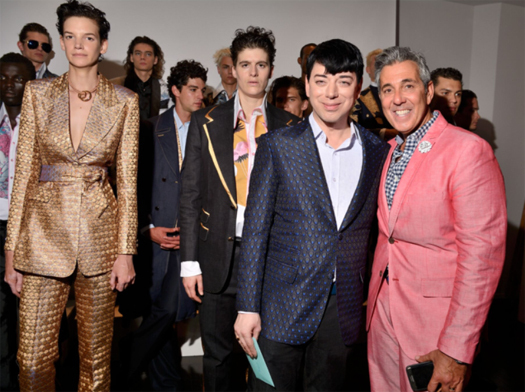 Designer Malan Breton showcased his Spring/Summer 2017 menswear collection at an exclusive studio in New York’s Meatpacking district during Men’s Fashion Week. The main collection is inspired by the 1969 Academy Award winning film “Alice’s Restaurant”. Breton applies ancient fabric weaving techniques in an unorthodox approach showcasing elaborate detail combined with unconfined liberated silhouettes cut with Savile Row precision, a testament to a newfound direction in menswear tailoring. This marks the designer’s fourth menswear collection, which boasted tremendous praise and accolades from top menswear editors and tastemakers in attendance. Titled ’Severance’ meaning to ’split’ or ‘divide into parts’. The designer this season is taking his direction to another level producing a capsule collection titled ‘The Butterfly Effect’ in addition to the main line, which is inspired by Taiwan dark forest nights. Breton displayed an innovative approach very opposite to his past productions. The idea was to streamline the collection in an exclusive and tasteful manner.